Fourteen beams of light shot into the night sky over Montreal on Saturday, one for each of the 14 victims of the École Polytechnique massacre that happened 25 years ago. Fourteen beams of light shot out into the night sky over Montreal on Saturday, one for each of the 14 victims of the École Polytechnique massacre that happened 25 years ago. On Dec. 6, 1989, 14 women were killed at Montreal's École Polytechnique by a gunman professing to hate feminists and the place women took in society. The gunman targeted women at Polytechnique because it was an engineering school, and he didn't like that women were pursuing powerful jobs that previously had been almost exclusively held by men. "They want to keep the advantages of women [e.g. cheaper insurance, extended maternity leave preceded by a preventative leave, etc.] while seizing for themselves those of men," the killer's suicide note read. 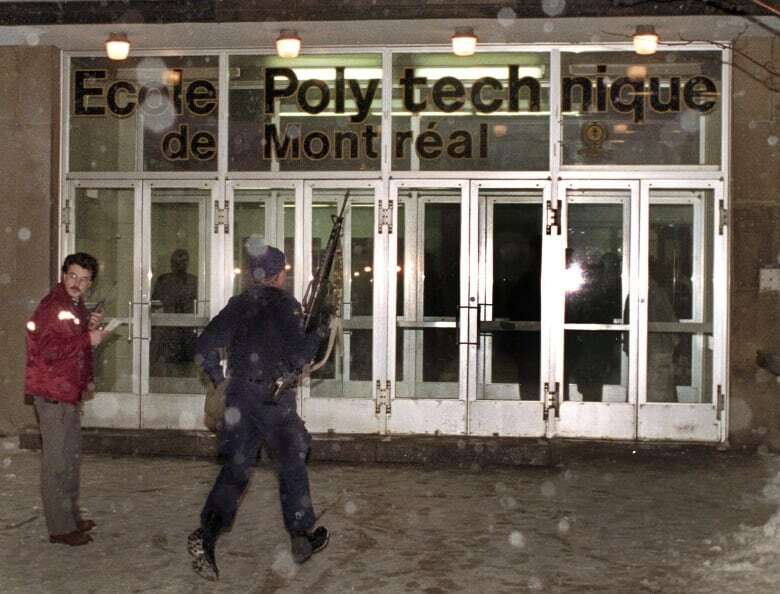 How will you #Rememberthe14 from the École Polytechnique massacre? He entered Polytechnique on Dec. 6, 1989, with a Ruger Mini-14 semi-automatic rifle. He stalked the halls, entered classrooms and separated the men from the women. By the time he turned the gun on himself, he had killed 14 women and had wounded 14 others — 10 of them women. Geneviève Bergeron, 21; Hélène Colgan, 23; Nathalie Croteau, 23; Barbara Daigneault, 22; Anne-Marie Edward, 21; Maud Haviernick, 29; Barbara Klucznik-Widajewicz​, 31; Maryse Laganière, 25; Maryse Leclair, 23; Anne-Marie Lemay, 22; Sonia Pelletier, 23; Michèle Richard, 21; Annie St-Arneault, 23; and Annie Turcotte, 21. Dozens of Montrealers and notable Quebecers assembled at the summit of Montreal's Mount Royal for a two-hour ceremony to mark the 25th anniversary of the massacre. Hosted by journalists Pierre Bruneau and Anne-Marie Dussault, the event featured short speeches by Premier Philippe Couillard and Mayor Denis Coderre, as well as several ministers and members of the National Assembly, gun control advocates Wendy Cukier and Heidi Rathjen, former federal politicians Dawn Black and Martin Cauchon, journalists, the director of the Montreal police, survivors of the shooting and many others. Those who spoke, spoke of violence against women, misogyny, feminism and gun control. Some recounted their memories of the events of Dec. 6, 1989 and the conversation that unfolded in their aftermath. Bruneau called the events that took place that night "impossible to forget." "We were shocked, we were confused. How we could have possibly had such a tragedy here in Canada?" asked Kim Campbell, former prime minister of Canada. Jean Doré, the mayor of Montreal in 1989, spoke to the crowd via video. "Twenty-five years later, why do we have to continue to commemorate this event? It's because equality between women and men has still not yet been achieved," Doré said. Dawn Black of the NDP in 1991 introduced a private member's bill asking that Dec. 6 become the National Day of Remembrance and Action on Violence Against Women. 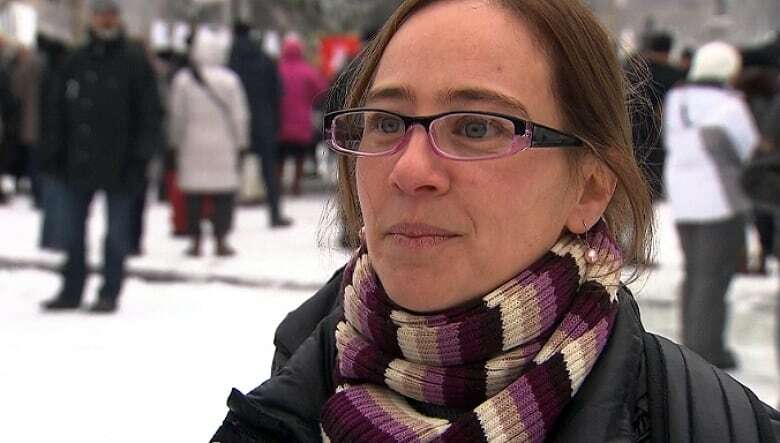 She said she came up against a lot of resistance from her male colleagues in the House of Commons, but with the support of the other female MPs and of a few men, they were able to get the bill passed. "In the violence, in the hatred, in the furor, all Canadians were exposed to reality of violence against women in its extreme," Black said of Dec. 6, adding that "violence against women is still with us in all of its ugly forms." Saturday morning, students gathered at a commemorative plaque on the campus, where they laid white roses and lit small lit candles in memory of the victims. Michèle Thibodeau-DeGuire, one of the first women to ever study at École Polytechnique, laid flowers at the site early Saturday afternoon, along with other members of the university and larger community. She has had a lengthy career as a civil engineer, and is the chairwoman of École Polytechnique's board of directors. Despite the tragedy that happened on Dec. 6, 1989, women should still feel more comfortable than ever to take their place in society, said Thibodeau-DeGuire. Since the shooting, the number of women attending the school has only increased, she said, and Polytechnique continues to be a safe place to study engineering. She said the shooting — a senseless act — shouldn't be the event that defines the school. "It's an extraordinary place," Thibodeau-DeGuire said. She encouraged women thinking about studying engineering to "take their place" in society. "It's a career in which women can be independent. She can have a rewarding career," Thibodeau-DeGuire said. On Saturday morning, a group of about 40 students gathered at the commemorative plaque at Polytechnique to say a few words and light candles in the victims' honour. The event was organized by the women's branch of the student association ASSÉ. As morning turned into afternoon, hundreds of others stopped by the plaque and at Place-du-6-décembre, a park dedicated to the victims of the massacre near Polytechnique. Some of those in attendance held up signs with the names and ages of the victims, while many others wore the white ribbon — a symbol of support to end violence against women. Véronique Latulippe travelled from Granby, Que., to participate in the 25th anniversary events. She works at Centre Entr'Elles, a women's support centre and network that works closely with victims of violence. "It's still a taboo subject," Latulippe said. "Women still have a hard time to denounce it, to leave their homes. We're here to continue to say it's not tolerable, it's zero-tolerance."